Formal subsumption of labor: in which capital buys abstract labor times, encloses workers in factories and struggles with them over the length of the working day. Ending with WW II. Real subsumption of labor: in which capital controls every aspect of the labor process and workers seek to become autonomous from capital. Collapsing at the turn of the 21st century. Full subsumption: In which the decline of the wage relation makes the difference between labor and being available for labor increasingly indiscernible, with every aspect of social reproduction included in capitals circuits of exchange, as the working class struggles to abolish itself. Ongoing. Cinema Hostis: subordinates both movement and time to hostility. Presents a world in which each is the enemy of each and the camera is the enemy of all. Ongoing. 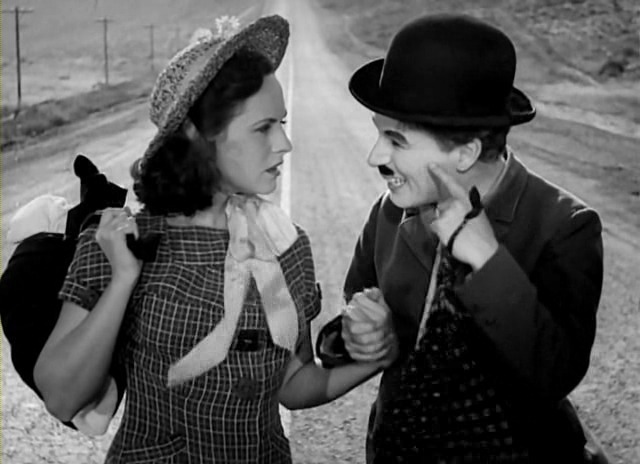 Charlie Chaplin’s Modern Times (1936) exemplifies affection-image compositions in the movement-image regime. Chaplin’s Tramp character goes from factory to prison to home, mechanically stumbling from one enclosed space after another. Chaplin’s comedy comes from responding to situations with inappropriate movements, including the micro movements of his face, thus transforming the situation in unexpected ways. Despite the relatively low number of close ups in Modern Times, the tramp’s face remains disconnected from the space around it, separated by its different make up and the abnormal connection between his expression and the actions. By crystallizing the “wrong affect,” the Tramp’s face makes the determinations of other characters’ expressions intelligible. He makes the audience wait to see how he will escape the difficulties each situation presents to him, suspending the laughter in the passionate element of anxiety. The Tramp’s face moves inappropriately. When the lunch signal sounds while he tries to rescue a fellow worker trapped in the gears of a huge machine, the Tramp gets his colleague’s food, and then eats and feeds the other worker with a calm and beatific expression of enjoyment rather than the expected resolved or panicked look. When the Tramp accidentally inhales some cocaine hidden in a saltshaker while in jail, his face is a spasm of desire, unlike the faces of the other prisoners and the guards, who do not know the reason for his over-stimulation. Perceiving the factory, the jail, and the home overwhelms the Tramp, and an affect uncorrelated with his situation wells up in him. The Tramp’s irrational affect exposes the process of industrial subjectivization, and eventually forges a way out. In the film’s conclusion, the Tramp and his lover find themselves excluded from all enclosures, homeless and unemployed, abandoned on the side of the road. In a close medium shot their two faces pass through series of expressions from surrender to determination in an accelerated coda of facial expressions. The lovers’ faces finally become smiling masks, expressing their newly found power to leave the metropolis towards the abstracted horizon of the industrial US’s mythical road. Movement-Images depict the form of time needed by the working class in order to revolutionize its struggle over the length of the working day. In an essay entitled “Three Temporal Dimensions of Class Struggle,” George Caffentzis elaborates the two forms of time proper to capital: the linear time used to measure production and the circular time used to track the reproduction of capital. Both forms measure movement. When labor appears as part of capital, it too must rely on those forms of temporality. Gilles Dauvé & Karl Nesic’s description of this period as “programmatist”1 implies that Labor needed forms of time that measured the movements of production: a circular time to orient itself within the capital’s expanded reproduction, and a linear time with which to articulate its programs. In this period labor needed a temporality capable of linking perception to moving bodies functioning as centers of indetermination and subjectivity, temporality within which the actions of those bodies could meet their objects in the world.2 If the production process determines the essence of the labor-capital relation it does so by determining the time of social relations. In the facial close up, affect appears as a mobile impulse on a sensory nerve. The facial close up composes affects from the relations between facial features and distributes those affects along a spectrum between the active pole desire and the reflective pole of wonder. The tight framing of the close up abstracts the face from its spatiotemporal coordinates, allowing films to express pure qualities independently of situations within which qualities are realized. A face with features that break its outline expresses the extreme of desire while a stilled, plate-like face expresses wonder. Writing about this period of formal subsumption, Capital creates a mode of subjectivity immanent to the abstract labor power that it produces. Individual, “free,” skilled, servile workers and cooperating subjects born of industry were both results of the contradictory movement of capital’s antagonisms, and its distribution of a range of affects between subjects. Subsumption’s affects emerge from the latent possibilities in the flows and axioms specific to that period of capitalism as opposed to new affects capable of transforming the image regime within which they function. Nonetheless potential for the new emerges in the affection image’s genetic sign. Gilles Deleuze points out that close ups sometimes include a fragment of space to the side of the face, removed from its spatio-temporal coordinates. Any space can be framed as a provisionally closed set of relations, just as the face can. Such abstracted whatever spaces function as the affection-image’s genetic sign, causing semiotic mutations and articulating a different image regime. Subjects disappear in whatever spaces, and affect appears externally as an abstracted set of relations enduring a passage of time. The time-image emerges as the increased use of whatever spaces changes cinematic affect from an expression crystalized within a subject into the time of relations in general, opening it to non-human qualities, and further sublating affect into powers of thought. In Roberto Rossellini’s Europa 51, Irene perceives the Roman slums as indifferent spaces, the abstraction of the streets and interiors standing in contrast with the cartographic specificity of the bourgeois home. In her family, she works as a redundant housewife with a waged staff who she manages instead of doing domestic labor directly. The unwaged existence of the poor and destitute women marks Europa 51’s Rome as a space of bare life, the mode of human being unable to sustain citizenship: the inform being societies of control must constantly abject. Irene’s mother mentions bare life’s essential figure when she warns her daughter that communists will end up in concentration camps if war breaks out again. Irene sees the factory she visits as the yard for a camp, haunting the edges of the film with the figure. Giorgio Agamben points out that since WWII camps have become the nomos of the modern metropolis, figuring the transformation of political space into zones of force.3 These are variations on camp space, whatever spaces separate themselves from any world. Women enclosed within the forced labor of private reproduction incarnate bear life in societies of control, a status that paradoxically confers on their potential refusal of that labor the power to end the reproduction of capitalism. Through the banal, bored subjectivity of a stunned housewife, Europa 51 expresses a revolutionary desire: the desire to see the world just as it is in order to destroy its mediations. Irene’s desire surges within the difference between a zone marked as expressing the actual contradictions of social reproduction in postwar Italy, her home, and a fantastical zone presented as a virtual alternative mode of reproduction, the slums. The film presents both spaces through Irene’s schematic, time-imaged perceptions. Her refusal of her family’s private reproduction of the bourgeoisie and her flight into collectivized proletarian social reproduction function are not simply expressions of a desire to perform women’s work by other means. They are impressions of an impersonal need for systemic change based on a change in her society’s mode of reproduction. The penetration of economy into every aspect of life is more than legible in the HSBC Holdings advertisement reading “in the future, there will be no more markets waiting to emerge.” When living becomes indiscernible from exchange, nothing new will emerge. Various all too familiar features of the contemporary economy have transformed what little time workers could use for their reproduction into time during which they must be available for work.5 Concretely this means: last-minute scheduling practices in minimum wage jobs, the tendency towards independent contracting in higher waged sectors, the growth of the flat corporation, the use of communications technology to tethers us to our bosses, etc. Meanwhile, the “universal market” in services has completely colonized the sphere of reproduction. In the period of empire life is completely subordinated to the economic and movement and time to hostility. For Tiqqun, the Hostis names that which has taken the place of social relations at a certain moment of the moving contradiction — the lived economy that reduces us to bare life. The cinematic expression of this contradiction results in films in which each is the enemy of each and the camera is the enemy of all. Alex Rivera’s Sleep Dealer (2008) develops the affective signs of the hostis while mapping full subsumption from the perspective of the surplus populations it generates due to high organic composition of capital. Full subsumption separates the proletariat from itself as flows of people increasingly swerve away from flows of money for which they compete. In Rivera’s film, Memo leaves his native Oaxacan farming village, which is been desiccated by a damn that privatized its water source. He goes to find work in a maquiadora in a border city, where the laborers remotely operate construction robots in the US. Sleep Dealer develops the Rift while mapping full subsumption from the perspective of the surplus populations generated by the contemporary economy. Full subsumption means a high degree of automation, which means fewer waged worker and larger relative surplus populations. In addition to marginal profit from exchange, capital relies on dispossession as form of accumulation. The current hedge-fund driven land grab in Africa illustrates the point. It is there that populations are driven off land that will be farmed mechanically, but they will never be absorbed into the economy, because industry has also been mechanized. Paradoxically, full subsumption means that as capital integrates labor more completely, separations within the proletariat intensify as capital swerves its monetary flows away from people. The new restructuring of capitalist flows requires new axioms that produce new types and forms of subjectivity. In Cinema Hostis, affective Rift is the degree zero image from which others differentiate themselves. A Rift sets up an antagonism between characters defined exclusively in terms of their separation from each other, and over the course of a film, the camera takes up all the positions within the antagonism. Sleep Dealer doesn’t exactly set up an antagonism between two class subjects. Instead it sets up a complex antagonism among the workers themselves by using commodification to create a separation in the most intimate relationship in the film, that between Memo and his lover. Though they seem in love, she sells her memories of being with him on an internet market. When Memo finds out that she sells her memories of him, their relationship swerves, because a commodity is made for the purposes of selling. Memo can no longer read Luz’s intent in seeing him as a form of affection or attraction. It becomes a form of economy. Though the film establishes the possibility that workers can bond together as workers in the very beginning, the film divides those characters in an extreme way before uniting them in a palpably false manner. Cinematic Rifts create a field of relations between bodies from a specified position within a totality of asocial relations. The Rift’s signs of composition form a spectrum between pole of Visors and the pole of Drones. Visors render percepts of living bodies from positions in an antagonistic field of economic relations, while Drones render a technical image surveying that field. The part of the spectrum closer to Drones allows commercial films to use another recording device within the diegesis as an alibi for a film’s own enunciative hostility towards its characters. The various hybrid Visor-Drone (hand held) cameras in the Blair Witch Project and Paranormal Activity function as a specification of hostile camera separate from the base level of enunciation. Although a Drone has a palpably technical essence that can be combined with a Visor’s organic character, it does not form part of a neuro-image6 or an interactive-image7. The drone’s image appears on the screens of the devices that keep us available for labor and turn all space and time into a potentially laborious chronotope mediating the economization of the social reflected in the Cinema Hostis. Luz’s traffic in her memories of being with him allows Riva to develop the Rift in effort to allegorize different levels of the materiality of labor. Luz sells her memory on a network she plugs into through nodes in on her body of the same kind as the nodes through which Memo controls the construction robots in when he sells his labor time. A US military drone pilot who shot Memo’s father buys Luz’s subjective and semi-subjective shots from Luz’s perspective. Memo, Luz, and the pilot structurally belong to decompose class and the interest of each contradict the interests of another. Sleep Dealer brings them together through the very commodity markets separating them. 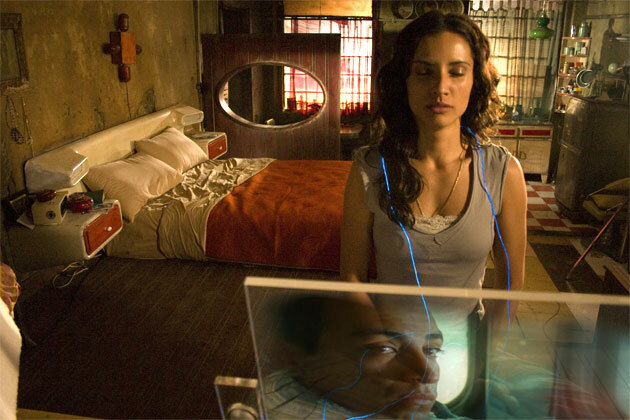 The pilot buys Luz’s memories to find Memo, and eventually helps him to destroy the dam that has privatized the water in Memo’s region, turning the farmers of his village into a surplus population. The film hastens to its close with Memo helping the pilot disappear. Cinema Hostis’s first image-type, the Rift, has two signs of composition: Visors, shots from the point of view of a human enemy, and Drones or lens genetic sign, a shot from the point of view of a diagetically displayed camera. Sleep Dealer combines Visors with the Drones by having Luz sell her memories. She becomes both a human enemy and a hostile recording device. The Clinamen is Rift’s genetic sign. A Clinamen combines multiple, antagonistic points of view in a single extended take, establishing each perspective through a reframing, such as the camera movements running through the tense scenes between Luz and Memo. 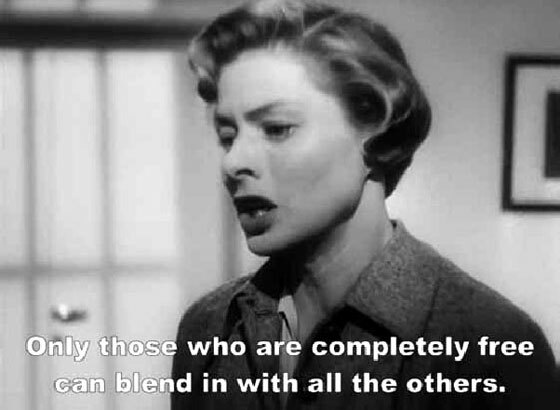 In Cinema I and Cinema II, Gilles Deleuze describes a passionate art that narrates a consciousness which must either suffer the world or change it. If consciousness cannot recreate the world according to its desires, the world as it is degrades and confuses consciousness while weakening bodies. Under each regime, the labor-capital relation determines labor’s capacity to act. The Movement-Image presents an active consciousness moving rationally through a comprehensible world to solve problems, accomplish goals and execute programs. The Time-Image presents a passional consciousness, stunned by the world situation, and looking for the determinations of its circumstances. Deleuze’s two cinematic regimes irrupt dialectically from the levels of subsumption before and after World War II, and the third period is determined by the non-relation between surplus populations and surplus capital in our time. Real subsumption was a fact of labor’s life but workers’ victories were in struggles over absolute surplus value – the length of work, rather than its intensity. The prewar movement image developed during an era dominated by struggles in the capitalist core over the formal subsumption of labor: over the length of the working day and the right to vacations and holidays. The Movement-Image lost salience, and the Time-Image replaced it once Taylorization had been completed and introduced even in the semi-peripheral countries such as Italy. It expresses the real subsumption of labor, in which capital controls every aspect of the labor process and workers struggle over hourly wages and working conditions. With the 21st century comes Cinema Hostis and full subsumption, in which the difference between labor and being available for labor become increasingly indiscernible: every aspect of social reproduction has been included in capitals circuits of exchange. The ever-rising organic composition of capital leads to structural unemployment, relative surplus population that cannot be absorbed into the waged labor force, and a working class seeking to abolish itself. Louis-Georges Schwartz is a scholar and activist who heads the MA Program in Film Studies at Ohio University. In order to secure tenure he wrote a short book about the case law controlling the use of film and video evidence in United States Courts entitled Mechanical Witness. He is also the author articles on le stye indirect libre in cinema, Bazinian photographic ontology, the genealogy of the concept "life," a subject on which he edited a special issue of Discourse. He is currently working on a project seeking to introduce historical materialist methodology to Film Studies by positing third Deleuzian image type. As an activist Schwartz works with organisms seeking to establish dual power in the North America, in part through screenings of La Commune, 1871 at free schools as well as collective film analysis events as Common Cinema Laboratories. Schwartz is an active supporter of University divestment and cultural boycott of Israel.